In our baptismal covenant we promise, with God’s help, to worship, evangelize, teach, love, serve and strive for justice for all people. God has a mission in the world and God has the body of Christ – as members of the church, we are God’s laborers in the vineyard, called to participate with God in God’s mission of love and redemption for all. In order to serve, we need to be formed, as disciples of Jesus Christ. How do we continue to grow in faith? How do we discern our spiritual gifts? How do you discern what new or renewed ministry is God calling us to? 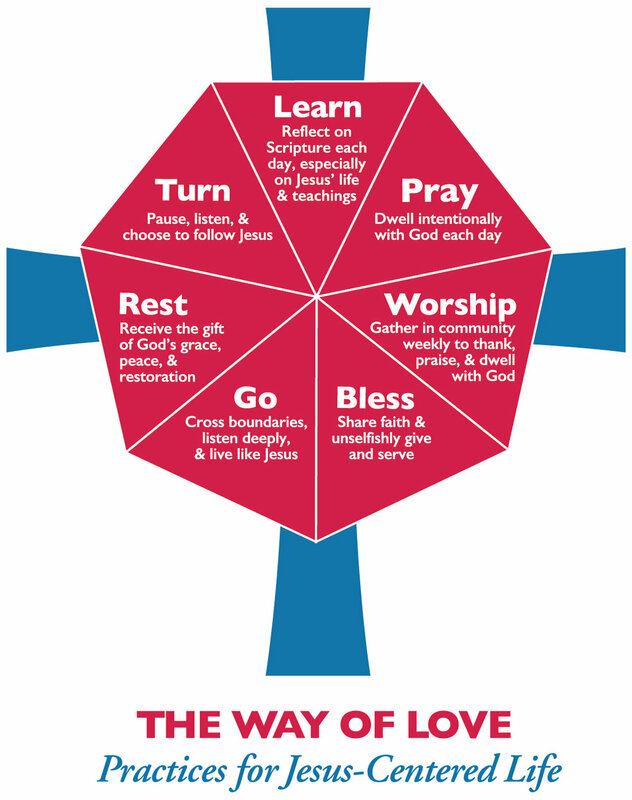 ChurchNext offers a course on Spiritual Direction - discussing what it is, how it works, whether it might be right for you - you can find this class and others HERE. Bethany House of Prayer – a retreat and spiritual direction center run by the Sisterhood of St. Anne. Adelynrood - a retreat and conference center run by the Society of the Companions of the Holy Cross – offering women and men conferences, workshop and individual and group retreats. Spiritual Direction International – an inter-faith resource for information about spiritual direction. “A rule of life is a commitment to live your life in a particular way. It is meant to be crafted with prayer and discernment, in partnership with God, as you consider the way God made you and the values God has inscribed upon your heart. Once written, it serves as a tool that can help you make decisions for your life and determine how best to order your days.” From www.sacredordinarydays.com – click here for resources on creating a rule of life. Introduction to the Examen at The Hive Apiary. Practicing Ignatian Examen or Review Your Day with God. Simple prayer card for practicing the Examen HERE. Forward Movement offers many resources for spiritual development. Forward Day By Day offers daily prayers, the daily office, prayers on the liturgical calendar and more. Vanderbilt Divinity Library offers the Revised Common Lectionary for daily readings and prayers. Pray As You Go is a website and app for audio prayers, music, scripture, and reflection. Also, Strengthsfinder and The Myers-Briggs Personality Type are two widely used personality tools in business and non-profit management. Education for Ministry (EfM) – EfM is a unique four-year distance learning certificate program in theological education based upon small-group study and practice. EfM helps the faithful encounter the breadth and depth of the Christian tradition and bring it into conversation with their experiences of the world as they study, worship, and engage in theological reflection together. For more information or to join a group, contact EfM coordinator, Jerry Tepe. ChurchNext – ChurchNext is a set of online classes where you can learn from expert teachers in Scripture, liturgy, and important Christian topics. Founded by the Rev. Chris Yaw. More information here. Montreal Diocesan Theological College (Montreal Dio) - associated with the McGill University School of Theology, Montreal Dio offers classes online, in Montreal, and a reading and tutorial program. Classes are available to lay people as well as those in formation for ordination. Anglican Episcopal Community of Learning – associated with the Boston University School of Theology, offers a learning community dedicated to nurturing and preparing Episcopalians and other Anglicans for future leadership and service in and through the church. Trinity Institute - A yearly conference hosted by Trinity Wall Street and available for watching live as well as archived. Click here for a list of speakers at the 2018 conference. Formation Network NH – The Formation Network NH seeks to provide a way for formation leaders in the diocese to share ideas, encourage each other, and collaborate. Linnae Peterson is the coordinator of the network and is available for consultation and ideas. Check out Linnae’s blog, Roots and Branches and the Formation Network NH facebook page. Province I Christian Formation – Province I (the dioceses of New England) also hosts a variety of Christian Formation opportunities and networking and an annual conference for formation leaders. FORMA - FORMA celebrates, equips, supports and connects leaders who form followers of Jesus. Baptized for Life - lots of resources for discipleship. Sharon Ely Pearson’s blog Rows of Sharon has many ideas and resources for Christian Formation. Sharon is an editor at Church Publishing. Episcopal Church Evangelism Initiatives - Episcopalians are passionate about proclaiming the Good News of Jesus Christ in our words and actions. Through the spiritual practice of evangelism, we seek, name and celebrate Jesus’ loving presence in the stories of all people - then invite everyone to MORE. Includes Evangelism 101 toolkit, information about Revivals, and a practical theology for evangelism. Beloved Community Story Sharing – The Beloved Community StorySharing Campaign seeks to help faith communities and individuals to share and receive stories of faith, race, and difference and to become more effective healers, reconcilers, and ambassadors of Christ in the world. Storysharing Guidebook contains lots of tools for implementing storysharing in congregations. Theology of Work – dedicated to the integration of work and faith. The High Calling is a devotional project of the Theology of Work. Renewal Works – a ministry of Forward Movement that focuses on spiritual growth by deepening love of God and neighbor in the lives of congregations, in the lives of ministries that animate those congregations, and in the lives of the individuals who bring life to those ministries. Invite Welcome Connect – Invite Welcome Connect is a ministry of relational evangelism and congregational empowerment allowing churches to become places of genuine connection for inviting the faith journeys and stories of everyone. Episcopal Evangelism Society - A ministry that support evangelism in the Episcopal Church through grants, research and communications. Voices of Faith – New Hampshire Voices of Faith is a community of people from multiple faith traditions who believe in the power of moral witness as a force for social and political transformation for a more just and equitable society. Vocies of Faith is sponsored by the American Friends Service Committee. NH Council of Churches –The New Hampshire Council of Churches – with faith-filled witness and action, mutual respect, and understanding – unites for Prayer, Learning, Justice, Peace, and Stewardship of God’s Creation. Led by the Rev. Jason Wells. Episcopal Public Policy Network - Within a range of Episcopal Church policies, EPPN focuses on several key areas determined by the Church's priorities of evangelism, reconciliation, and environmental stewardship, and issues where the Episcopal Church can have a unique and important voice at the federal level. Lombard Mennonite Peace Center – training in mediation, conflict management, and healthy congregations. Linnae Petersen is the coordinator of Formation Network NH and she is available for consultation, questions or ideas about Christian Formation for all ages. Looking for ideas and inspiration? Her blog - called Roots and Branches - highlights Christian Formation ideas and resources for adults, teens, and children, and explores ways to create inter-generational and digital opportunities to grow in faith. For more information or ideas about Christian Formation in New Hampshire, please contact Canon Tina Pickering.